Jungle Reef Outdoors have introduced to market some excellent products for all your outdoor needs. They have recently released a series of toolboxes sure to meet the requirements of even the most demanding customer. Jungle reef have discovered a need for High quality Durable toolboxes in the market place. Many customers are finding that the products sold at local stores don’t meet their expectations. What they’re after is something of quality construction that will stand up to the demands of heavy use. Jungle Reef Outdoors have designed two incredible toolboxes to fill this market gap. They come in two sizes to suit a range of different uses. The first is the TB150, which is a 150L toolbox with dimensions of 450mm, 700mm and 370mm. The big TB300 is only 10mm taller, but is 550mm wide and 900mm long. Both toolboxes are designed with this low profile to maximise their use in common vehicles, like utes, trucks and other trade vehicles. They will in fact fit under the hard cover of most utes on the market today. 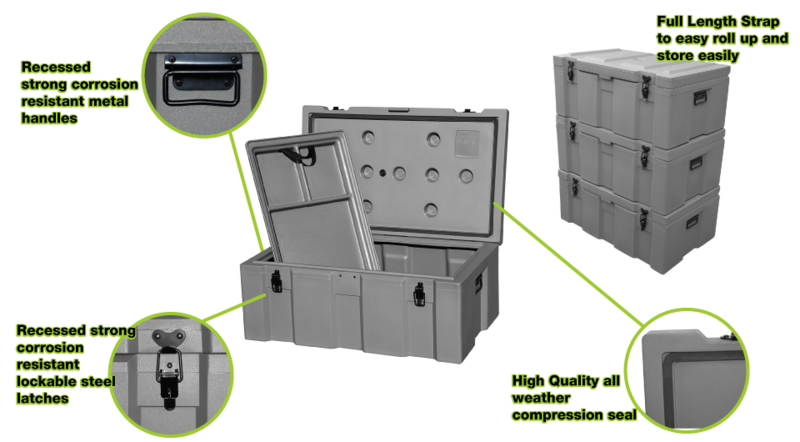 These Toolboxes are constructed with Heavy duty Polyethylene and for increased stability these Trunk lockers come with insulated Lids . This Not only gives you extra strength but the High density polyurethane which is injected in the lids also reduces the heat in the box. The Best part of the design is these toolboxes are Stackable . So you can stack them one above the other on your ute or when you are storing them . Toolbox users demand tough tool boxes, and Jungle Reef Outdoors delivers it in spades. Two major concerns are the weather and the security of the items they stow away. The first is controlled high quality compression seals, preventing water and dust from entering the box when you are in the outback or at a construction site . They are protected from thieves by recessed corrosion resistant lockable steel latches. When you need to move your toolbox, it’s bound to be heavy. This has been accounted for with strong corrosion resistant heavy duty metal handles that have been recessed into the body of each box. Not only are they useful for carrying the box, but also securing it to your vehicle. Both the TB 300 & TB 150 Models comes with a Tote tray which allows you to store the small parts and tools on the top so its easier for you to access them without having to dig into your toolbox. Being a Jungle Reef product, you know that the product is of great quality, is built to last and is designed to endure the conditions in which you wish to use the tool box.